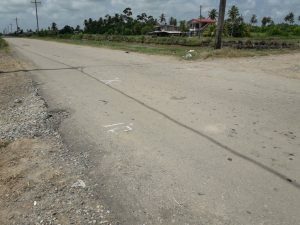 A 66-year-old Rural Constable of Mibicuri North, Blackbush Polder Coretyne on was on Thursday killed after a car that was allegedly speeding slammed into him on the Blackbush Polder Public road. Dead is Latchman Suhku called “Uncle Black” of Lot 186 Mibicuri North, Blackbush Polder, Corentyne. 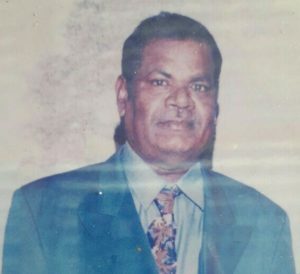 The man who was employed at the Mibicuri Police Station was on his way to work at around 8:30 am when he met his demise. The accident occurred just a stone’s throw away from the man’s home. According to police sources, motor car HB 8230 was proceeding south on the public road allegedly at a fast rate collided with Sukhu. The man’s grieving wife, s65-year-old Janet Sukhu told Demerara Waves that she helped her husband prepare his bag for work and left to attend to household duties when she heard her neighbour screaming that her husband met with an accident. “I left him in front and went to put the hose to the drum and I hear she screaming seh ‘uncle black get knock down’ and I could barely move around without help so I couldn’t go out there”. She said that neighbors, who saw the collision, stated that the man was thrown several feet in the air due to impact. Neighbours assisted and took the injured man to the Mibicuri Public Hospital where he was pronounced dead on arrival. The woman believed that driver of the motor car known as “Rano”, who is related to her husband, was speeding as her husband who was a ‘burly man’ sustained severe injuries to the back of his head, spinal injuries and broken bones about the body. “Speeding is always in issue on this road hay. Like then drivers ain’t get no time”. Commenting on her husband’s personality, Janet Suhku said that her husband who was employed as a constable for over 40 years adored his job and sought to provide a good life for his family. “He was kind and loving and everybody knew him and he never really miss work. He love he wuk. And he was going to he wuk and get he dead”. The driver of the vehicle is currently in police custody assisting with investigations. Suhku would have been celebrating his 44th wedding anniversary on Sunday.